Previously: Alberto El Patron & James Storm battled Bobby Lashley & Ethan Carter III in a wild main event. Tonight: It’s the last night in India and the final Impact before Slammiversary. It features Alberto El Patron, Eddie Edwards, James Storm & Mahabali Shera vs. Bobby Lashley, Davey Richards, Ethan Carter III & Kongo Kong. - Earlier tonight, Jeremy Borash and Bruce Prichard hosted several Slammiversary contract signings in the ring. The signings aired in quick succession and included Rosemary and Sienna, Davey Richards and Eddie Edwards, James Storm and EC3, and Bobby Lashley and Alberto El Patron. 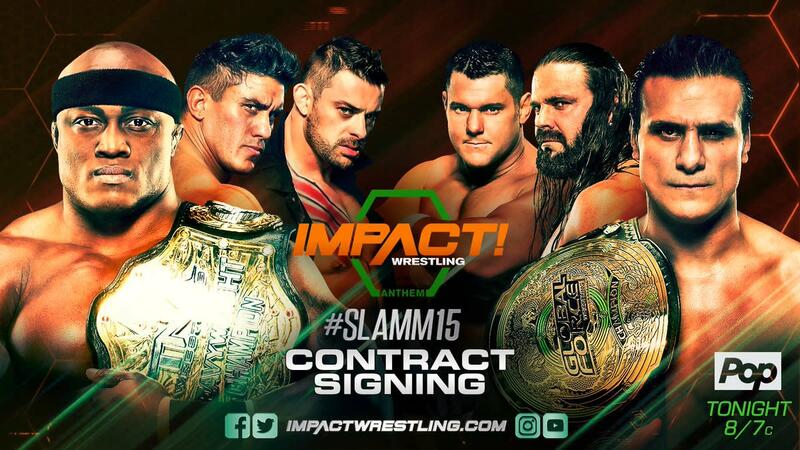 During the Lashley and El Patron signing, Edwards, Storm, Richards, and EC3 remained at the table. Before a brawl could break out, Prichard announced the eight-man main event for later tonight. Dutt and Sydal controlled the early part of the match until the heels briefly took over. Dutt and Sydal made a comeback and cleared the ring. The heels isolated Sydal in their corner. Dutt got the hot tag and ran wild. Dutt took out Low Ki with a dive to the floor and Sydal hit the Shooting Star Press on Lee for the win. - A training video of NFL free agent DeAngelo Williams aired. He discussed his passion for wrestling and the respect he has for wrestlers past and present. Adonis and Drake dominated the match, which came to an end when Drake hit the Gravy Train. - King Mo was announced as Bobby Lashley’s corner man at Slammiversary to counter Alberto’s father Dos Caras. Spud viciously attacked Swoggle in the corner until the ref tried to stop him. Spud pulled the ref's pants off and chased him in the corner. Swoggle pulled off Spud's pants and put him through the table to win the match. - J.B. and Joseph Park completed their training. J.B. told Park to find his inner monster and handed him an Abyss action figure. All six competitors brawled to start the match until the men went one-on-one. Rosemary scored a near fall on Van Ness and the match broke down into another brawl. Rosemary spit the green mist at Sienna, but she pushed Van Ness in the way. Allie took out Sienna, then Rosemary hit the Red Wedding on Van Ness to win the match. - Joseph Park tried to find his inner monster and found Abyss’s favorite weapon Janice nearby. The heels jumped Shera before the match started and before his partners were introduced. Shera had to be taken to the back for medical attention -- making it four-on-three. EC3 teased starting the match with Storm but quickly tagged out to Lashley. The heels took over and kept Edwards on their side of the ring. Edwards tried to make a tag, but the heels pulled Storm and El Patron off the apron. Shera made his return to the ring and ran wild on the heels. Kong missed a splash in the corner and Shera picked him up for a big slam. El Patron made the blind tag and hit the double foot stomp on Kong to win the match for his team.